Investors found themselves suddenly afraid of the dark on Monday. The president said he would have news on Chinese tariffs after the market closed and investors raced to the sidelines. The conventual wisdom was that if he was waiting until after the market closed it must be very bad news. Rumors had leaked earlier in the day that he would impose the $200 billion in tariffs against China but rumors are just rumors until the announcement becomes official. The official announcement was for 10% tariffs until the end of 2018 then they will jump to 25% .This will ease the pain on the consumer during the holiday shopping period. He also exempted some 300 products including the Apple Watch, AirPods and speakers, high chairs, bicycle helmets, etc. The president said if China retaliates against the U.S. he will immediately pursue tariffs on an additional $267 billion in imports. That would mean all Chinese products would have a tariff. The first round of tariffs was $50 billion on each side. When the tariffs were not as bad as expected and some high tech products were exempted, the futures rebounded in the afterhours session. The S&P futures are almost back to unchanged. It is very possible that investors will buy this dip just like they did on every prior tariff headline dip. The worst performing index by percentage was the Nasdaq at -1.4% but the worst chart was the Russell 2000. 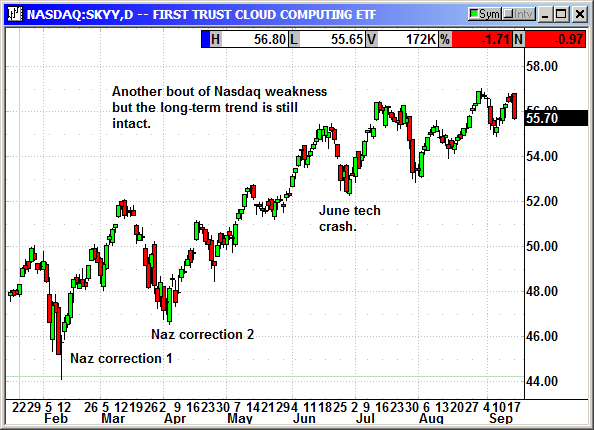 The index crashed because of the broad based selling that hit the small cap as well as the large cap tech stocks. The A/D ratio on the Nasdaq was more than 2:1 decliners over advancers. The small caps were almost 3:1 in favor of decliners. The small cap stocks should be the beneficiaries of increased trade tensions because they are mostly domestic and immune to tariffs. They should rebound now that the uncertainty has been erased. The Dow was evenly divided between advancers and decliners with Boeing and Apple the two biggest anchors. Surprisingly, Caterpillar, a normally tariff sensitive stock actually gained over $1 on no news. 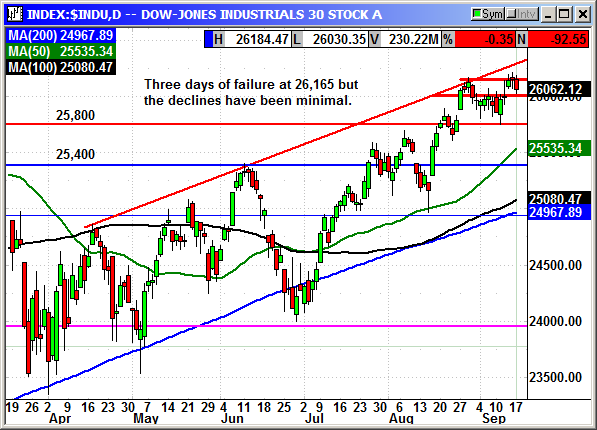 The Dow has failed for three consecutive days at 26,165 but the declines have not been bad. 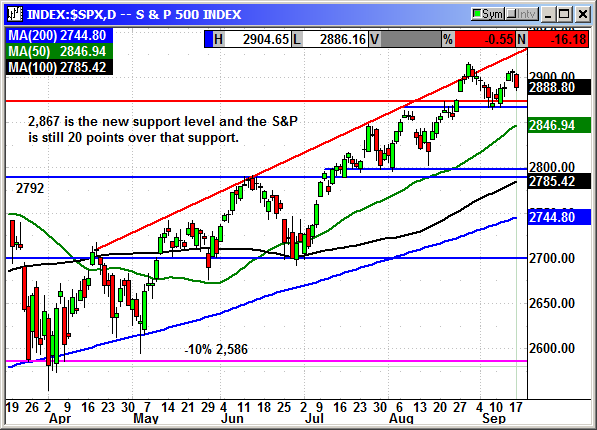 Even with today's 92-point drop, the index remained above the 26,000 level and prior resistance. This is actually decent relative strength given the headline stream. 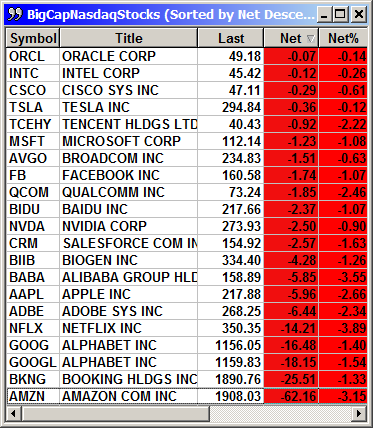 All the big cap Nasdaq stocks were negative but it was the FAANG stocks that really fell off the cliff. Amazon lost $62 to lead the Nasdaq lower. Amazon erased 26.1 Nasdaq points and Apple subtracted 25.2 points. Those two stocks accounted for about half of the Nasdaq decline. 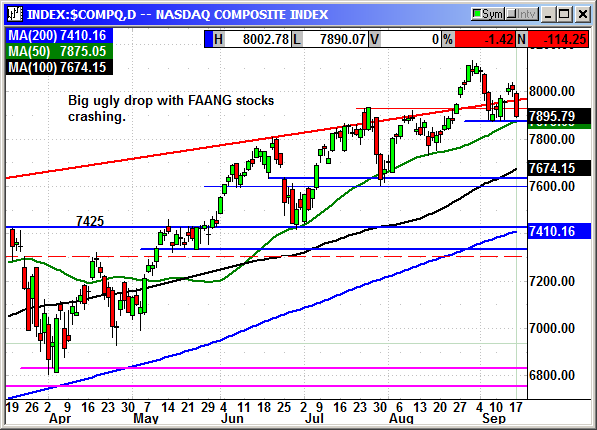 The Nasdaq Composite is trading below 8,000 again but has held at the 50-day at 7,875. 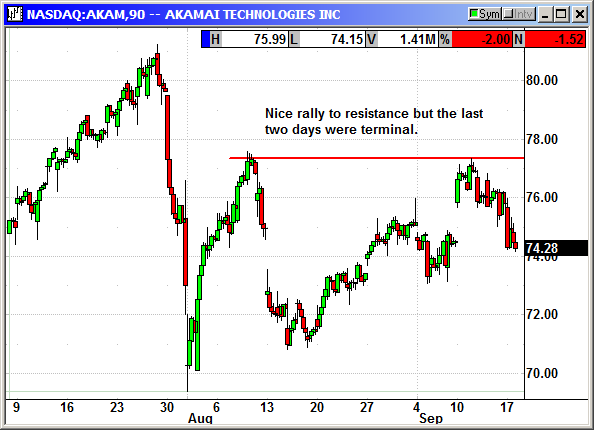 That uptrending support has held since late June. Since some Apple products were exempted from the tariffs, we could see a strong rebound. However, there are multiple news reports that the inexpensive iPhone XR is the hot product and the new X models are not in demand. That means Apple earnings could be pressured and the average selling price decline sharply. As Apple goes, so goes the Nasdaq. 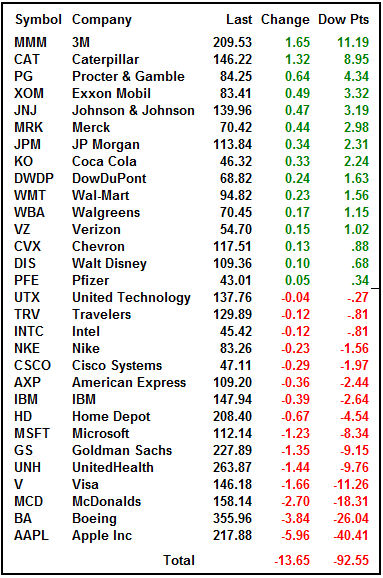 The S&P fell a respectable 16 points but most of that was Amazon and Apple along with other big cap techs and Boeing. Take out the top ten tariff sensitive stocks and the index might have been flat. Support is 2,867 and it closed more than 20 points higher. Any rebound at the open could trigger some rapid short covering. 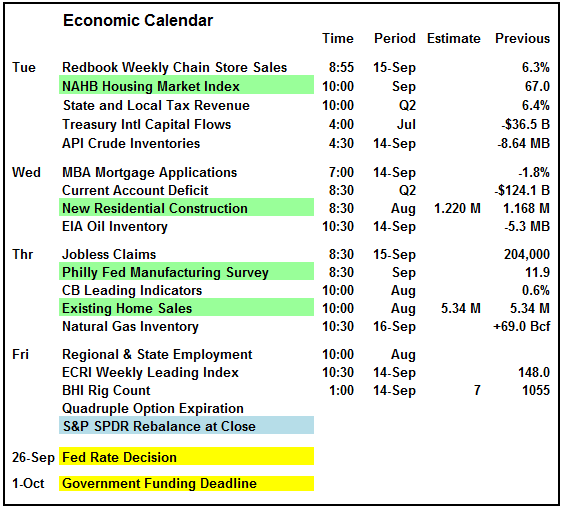 The calendar is heavy on housing reports this week but the most important regional manufacturing report for the month is the Philly Fed on Thursday. Next week is the Fed meeting and analysts will begin fretting over rate hikes as soon as the tariff headline fades on Tuesday. The big earnings for the week were Oracle and FedEx after the close on Monday. Both disappointed and both traded down sharply in afterhours. Micron is the next major tech to report on Thursday. 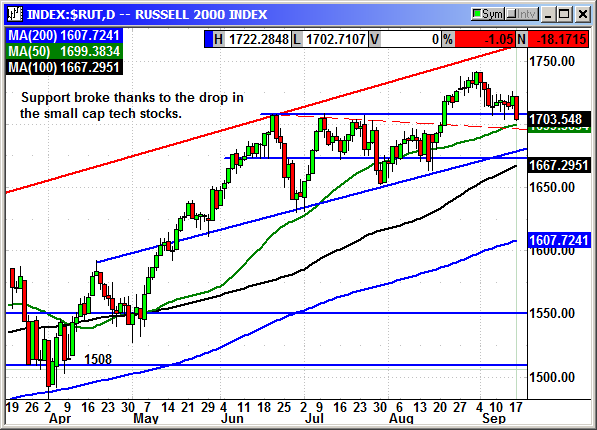 I would buy this dip as long as it does not break support on the S&P. I believe investors have decided the Chinese trade war will eventually have a successful ending. The Canadian talks are not even discussed in the press at this point. Everyone knows they will eventually concede and it is just a matter of time. The new headline is Kavanaugh and the chance for his nomination to implode. That is not a market mover but it will consumer a lot of the oxygen in the room and overpower market concerns. Sometimes a good distraction at the right time can make all the difference in the world. Buy Dec $188 call, currently $3.50, no initial stop loss due to potential volatility. 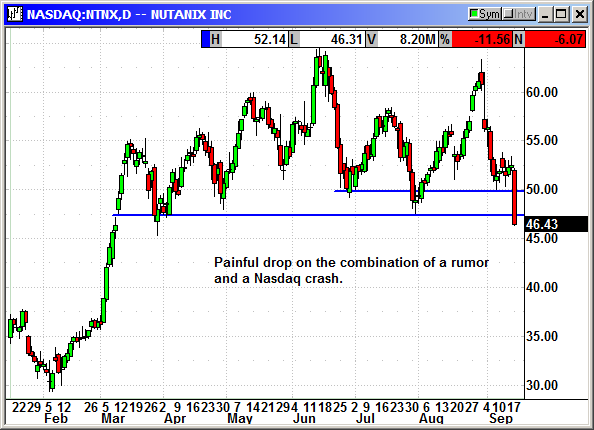 The long position was stopped at $74.85 in the Nasdaq crash. The long position was stopped at $47.50 in the Nasdaq crash. The recommendation was untriggered and has been cancelled. No specific news. 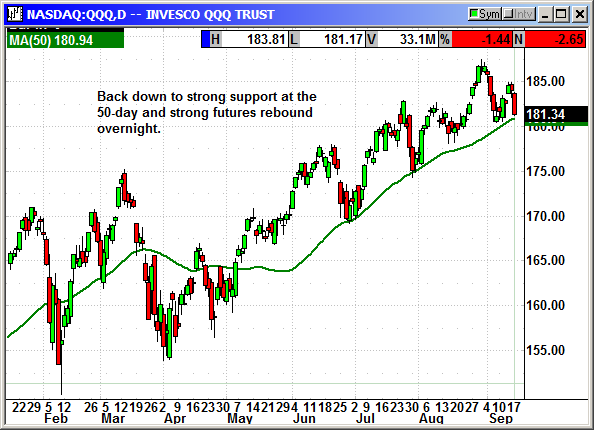 We had a decent position underway last week but the Nasdaq weakness knocked us out. 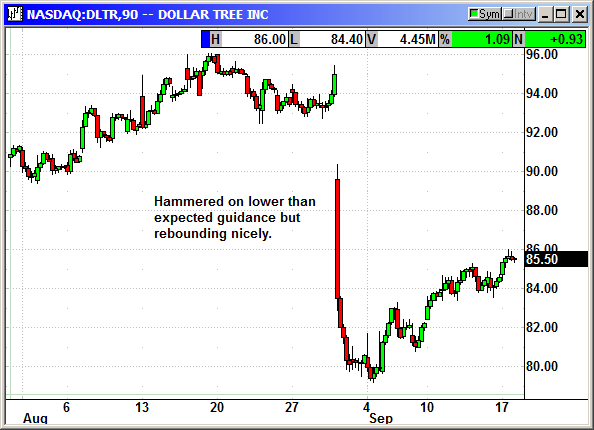 Closed 9/17: Long Nov $77.50 @ $2.68, exit $3.00, +.32 gain. There are no November options. This was not a good day for Nutanix with a $6 drop. The Information reported that Google Cloud is accelerating its efforts to gain market share in the private data-center space. Citing "two people with knowledge" the software giant is reportedly testing "customer designed computers" with storage and networking capabilities "for a handful of large customers to run in their private data centers." This is almost the exact same business model as Nutanix which combines "hyperconverged infrastructure technology" including combining computing, storage, networking and virtualization. The article goes on to say that Google may not expand their marketing beyond the few enterprise customers in the design phase but if it did, Nutanix would suffer. How much they would suffer is up for debate. Nutanix is exiting the hardware side of the business and that represented only 12% of its revenue last quarter, down -50%. Nutanix is moving towards the all software as a service model of combining all forms of cloud computing in one easy interface. Shares fell $6 to stop us out but I would buy it again once it finds a bottom. Google is a long way from testing a private hardware model for several enterprise customers to suddenly challenging Nutanix in the hyper-convergence space. Original Trade Description: Sept 10th. Nutanix, Inc. develops and provides an enterprise cloud operating system software. It offers enterprise applications, virtual desktop infrastructure, virtualization and cloud, big data, remote and branch office IT, and data protection and disaster recovery solutions; and hardware platforms and software options; and support and services. The company's products include Acropolis, a hyperconverged infrastructure solution to run any application; Prism, an infrastructure management solution with one-click operations; Nutanix Calm, an application-centric IT automation solution; Xi cloud services; Nutanix Xpress that eliminates the need for clunky SANs, expensive hypervisor licensing, and complex data protection and management software; and tools and technologies. It serves education, energy and utilities, financial services, healthcare, retail, and service provider industries, as well as state and local government, and the United States federal government. Nutanix, Inc. was founded in 2009 and is headquartered in San Jose, California. Company description from FinViz.com. The company reported a loss of 11 cents for Q2 compared to estimates for a loss of 22 cents. Revenue of $303.7 million rose 20% and beat estimates for $298.6 million. The problem came with the guidance. They expect a loss of 26-28 cents on revenue of $295-$310 million. Analysts were expecting a loss of 23 cents on $309 million. Shares had been near the recent highs and crashed back $13 to $50. Nutanix is shifting from a hardware sales model at zero margins in order to get their software installed on a subscription basis to a software only model and exiting the hardware business. They can do this because they are over the consumer acceptance stage. They no longer have to "buy" accounts with sweetheart hardware deals. The evolution out of the hardware space is a drag on revenue but revenue at zero margins is not a plus. Getting out of the high revenue low margin business is a plus but it means the revenue numbers will be a challenge for the first year. Multiple analysts came out in support of Nutanix saying the new long-term subscription offerings should trump the additional capex spending. Raymond James said they anticipate growth acceleration driven by new opportunities in multi-cloud as well as new products. RJ upped their price target from $64 to $74 and the stock is at $50. JMP Securities said the shares are undervalued and the higher capex and sales and marketing expenses were "prudent" due to the large market opportunity. Stifel remained positive with a $64 target saying "We believe Nutanix will sustain strong double digit software growth in coming years given its expanding product set." What was not shown in the bare earnings numbers was the 66% YoY growth in software and support billings and 49% YoY growth in software and support revenue. They also generated 78% adjusted gross margin in the shift to a Software-Defined business. Billings rose 37% to $395.1 million. Cash on hand rose 168% to $934.3 million. They added more than 1,000 customers in the quarter to put their base over 10,000 and they signed their largest deal in history for more than $20 million. For the current quarter they guided for revenue growth of 40-45% and billings growth of 50-55% with adjusted margins of 78-79%. Any company would move the sun and moon to have those kinds of revenue and margin projections. This is why we need to buy Nutanix on the selloff. Closed 9/17: Long Jan 2019 $55 Call @ $5.70, exit $3.40, -2.30 loss. No specific news. Shares dropped with the Nasdaq. 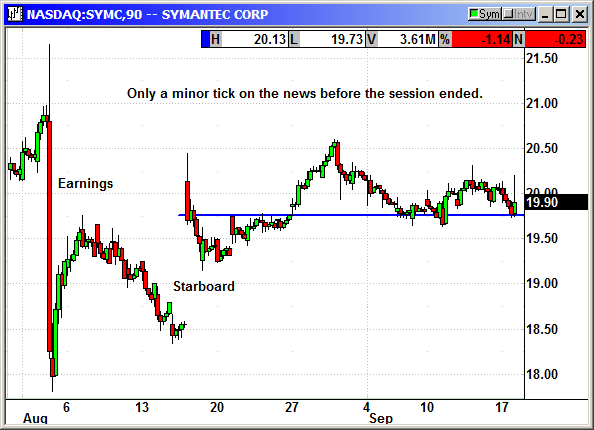 After the bell today, Symantec named three Starboard nominees to the board. Starboard had nominated 5. The company said it would also negotiate with Starboard for one more seat to be filled at the annual meeting. The managing member at Starboard, Peter Feld, was one of the new board members. Symantec said two current directors would not stand for reelection. When the nominations are completed there will be 13 board members and at least four from Starboard. This should build a fire under Symantec shares. The announcement came too late for the stock to trade in the afterhours session. 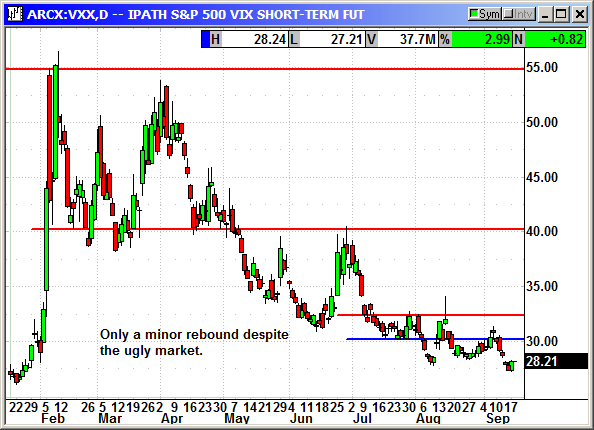 The VIX/VXX rebounded slightly today but considering the market decline the VXX move was minimal.